The CSI Orchestra Performs in The Center for the Arts Concert Hall. Young orchestra students from across Staten Island performed their end-of-semester CSI Orchestra concert at the Center for the Arts Springer Concert Hall on May 6. During the spring semester, the Orchestra students received sectional instruction in a side-by-side performance format from the professional musicians of the Richmond County Orchestra. This unique personalized instruction experience provided these students with an exceptional opportunity to enhance their musical abilities. A generous grant from the Frank & Lydia Bergen Foundation provided the funding to secure this distinctive instructional opportunity. The concert featured Staten Island stars performing Bach and Mozart concertos. Meagan Lee, a 10-year-old student of Dr. Sylvia Kahan, performed Bach’s Piano Concerto in D Minor. Winners of the 2017 CSI Performance Competition for Strings performed Bach and Mozart violin concertos. Christina Pan, the 12-year-old middle school division winner, and a student of Mr. Roman Berlinsky, performed Bach’s Violin Concerto A Minor. Ganling Chu Braganti, the 18-year-old high school division winner, a student of Dr. Anthony Harper at Staten Island Conservatory, performed Mozart’s Fourth Violin Concerto in D Major. 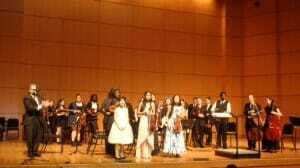 The CSI Performance Competition for Strings is an initiative developed by the CSI Music Program to recognize the excellent musical education that is provided by the experienced string teachers in the Staten Island area. These dedicated educators help motivate young people to develop their artistic and musical talent. The CSI Performance Competition for Strings provides an opportunity to showcase the musical talents of their students, which are a direct result of their committed efforts and is designed to provide a solo performance platform for students who are Staten Island residents. The Competition is offered every year as a comprehensive event for all instruments, in two categories: for middle school students (Grades 6 through and for high school students (Grades 9 through 12). There are cash prizes as well as citations for exceptional musicianship and artistry. The third annual CSI Performance Competition for Strings is scheduled for February 2019. The CSI Orchestra was founded in 2013 through a collaboration between the College of Staten Island and Curtis High School. Its mission is to provide opportunities for orchestral performance by young people on the Island through exposure to the rich repertoire of the symphony, while being directed and mentored by professional musicians. The CSI Orchestra is a College course, open to all CSI students, as well as community members. It also offers the possibility for high school students to receive college credit through the CSI/CUNY College Now program. This is the first orchestral program of its kind offered on Staten Island. In addition to Curtis High School, many other schools from across the Borough participate in this unique program, including Port Richmond High School, New Dorp High School, Staten Island Academy, Staten Island Tech High School, Tottenville High School, and IS 61. The co-directors of the CSI Orchestra are Dr. Dan Auerbach, Professor of Music, College of Staten Island, and James Minenna, Professor of Music, Curtis High School. The CSI Orchestra serves a specific mission, to enable students to receive a comprehensive musical education. Many of the participating students could not otherwise afford such personalized musical instruction. “These young students deserve a musical education and I am just glad that we received the necessary funding from the Frank & Lydia Bergen Foundation to keep their dreams alive,” commented Dr. Auerbach. “I am looking forward to next semester’s concert featuring the winners of the 2018 CSI Performance Competition for Strings, showcasing the hard work and dedication of both Staten Island students and their teachers,” he noted. The CSI Performance Competition for Strings, a sister project of the CSI Orchestra, receives funding through sponsorships provided by members of the CSI Administration, the Performing and Creative Arts Department at CSI, Strings & Other Things in Manhattan, and the Frank & Lydia Bergen Foundation. Private donors provide supplemental contributions critical to the program. Next semester’s CSI Orchestra concert, scheduled for December 2018, will again feature CSI Orchestra students accompanied by professional musicians from the Staten Island Philharmonic. Winners of the 2018 CSI Performance Competition for Strings will rehearse with the CSI Orchestra during its 2018-2019 season.